Signs of luminescent material (thickness 1.2 mm) for use in combination with our instängningslarm. 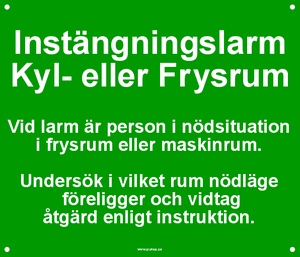 The large sign with explanatory text in Swedish is used when the alarm central unit is mounted far from the cold room, in a larger adjoining room. There it may needed to clarify why the alarm is on. Contact us for similar signs with text in English or other languages. They are mounted with 4 screws or the like, one in each corner. It has external dimensions 210x180mm and its mounting screws have 200x170mm between the holes.